Qatar Airways group chief executive, Akbar Al Baker, and JetSuite founder and chief executive officer, Alex Wilcox, reaffirmed their commitment at the Farnborough International Airshow to expanding JetSuite and JetSuiteX. In April, Qatar Airways took a minority stake in leading U.S private aviation company JetSuite and its sibling company, JetSuiteX. The Qatar Airways investment will enable faster expansion of the JetSuite fleet and its ability to reach new destinations, including the potential to bring the semi-private model to additional US regions. The JetSuiteX Embraer 135 jet is one of six state-of-the-art aircraft displayed this week by Qatar Airways at Farnborough Airshow. The luxuriously reconfigured aircraft offers 30 comfortable Business Class style seats. It offers a soft private jet interior, along with extra soundproofing, power outlets at every seat and free messaging wi-fi, offering passengers a premium and comfortable travel experience. Al Baker said: "Our investment in JetSuite and JetSuiteX is one that we are extremely excited about and it is a privilege to display the JetSuiteX Embraer 135 at the Farnborough Airshow, providing spectators with the chance to see this state-of-the-art aircraft up close. Qatar Airways and JetSuite share many of the same core values. We look forward to seeing JetSuite's private aviation business continue to grow and flourish, and offer even more air travel choice of destinations on the US West Coast and beyond." Wilcox said: "We are thrilled to showcase our JetSuiteX Embraer 135 aircraft here on the world stage at the Farnborough Airshow. With the recent investment from Qatar Airways, we are looking forward to taking both our JetSuite private charter and JetSuiteX semi-private scheduled service brands to new heights and introducing these premium air travel experiences to new markets." The Qatar Airways investment in JetSuite will help fuel the growth of JetSuite's private aviation business, which currently focuses on light and very light jets. The investment extends to JetSuiteX, the sibling company to JetSuite, further accelerating the expansion of its acclaimed semi-private air service on the U.S. West Coast and beyond. JetSuiteX fills a niche in underserved short-haul markets and small airports, and enjoys a Net Promoter Score over 90, higher than the major US airlines. 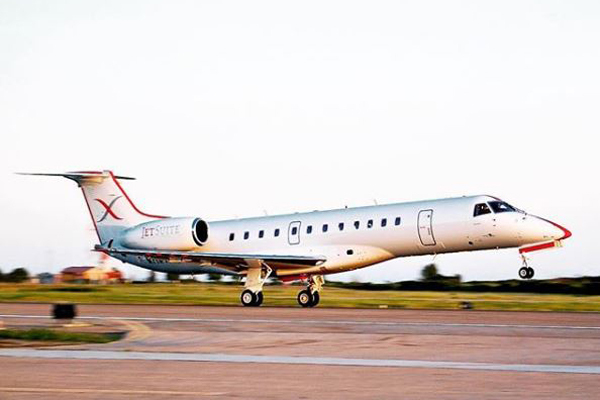 JetSuiteX operates its fleet of Embraer 135 aircraft from private terminals in California and Nevada, with no lines, no waiting and no stress, at a price competitive with commercial travel. The Qatar Airways investment will enable faster expansion of this fleet and the ability to reach new destinations, including the potential to bring the semi-private model to additional US regions.